SEO (search engine optimization), is one of the hottest acronyms in the online marketing world right now. When you have good SEO, search engines like Google will place you higher in their rankings. High search rankings more often than not result in higher traffic to your website/store. If your business has a physical location, you need to be paying particular attention to local SEO. Traditional and local SEO are like a pair of brothers. They have the same DNA, but they each have their own defining traits that make them very different. Traditional organic SEO focuses on optimizing your website so that anyone in the world can find you in search. Local SEO brings in a geographic component into the mix and focuses on helping your business appear in searches relative to a specific location (city, state, etc.). Let’s look at the difference between traditional and local SEO. When I search for the term “kitchen supplies,” the top two organic results (highlighted in green) are Amazon and Macy’s, hardly local indie retailers. 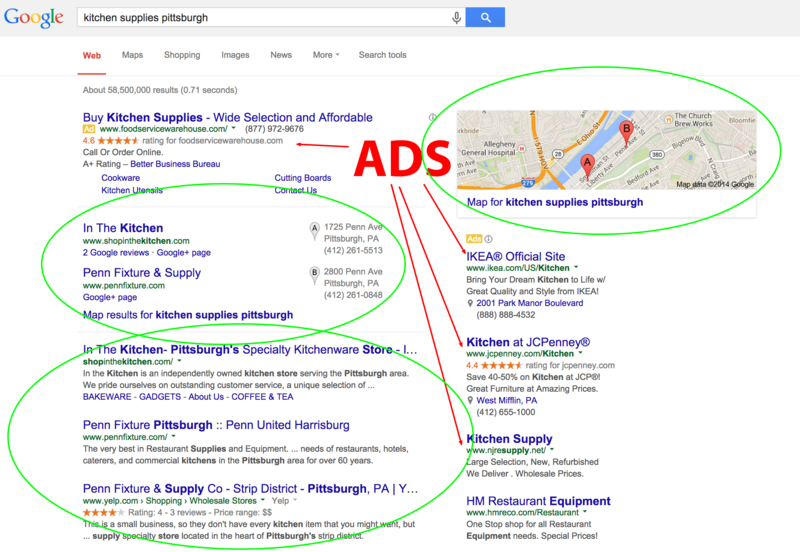 When I add “Pittsburgh” to the search, small businesses (highlighted in green) start to pop up all over the screen. This is because I told Google that I am looking for kitchen supplies in my local area (Pittsburgh). This is local SEO. Now that you know what local SEO is and how it works, let’s talk about ways that you can improve it for your store. We have four easy steps that you can take to improve your local SEO right away. Google is the #1 search engine, and if you’re not listed on it you’re missing out on about 67% of total search traffic. The foundation of your local SEO efforts will be based around your Google presence. This process is pretty quick and simple but will provide enormous benefits to your local SEO. 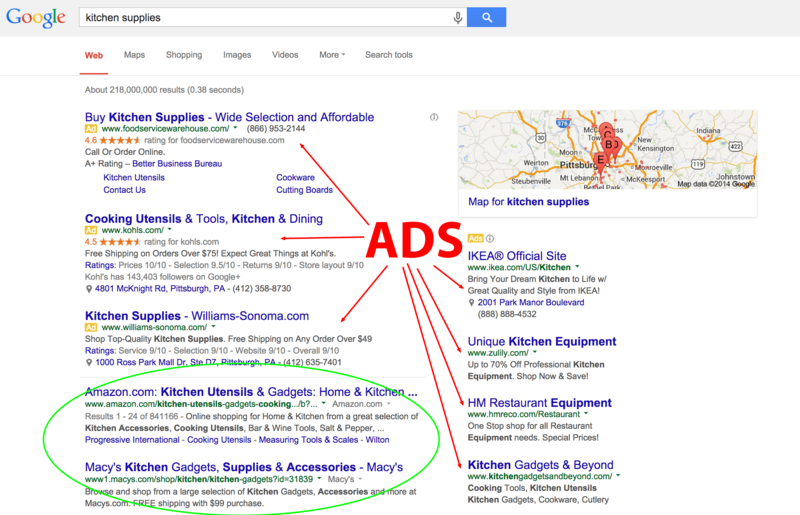 For more information on how to set up your store’s presence on Google, check out my previous blog. 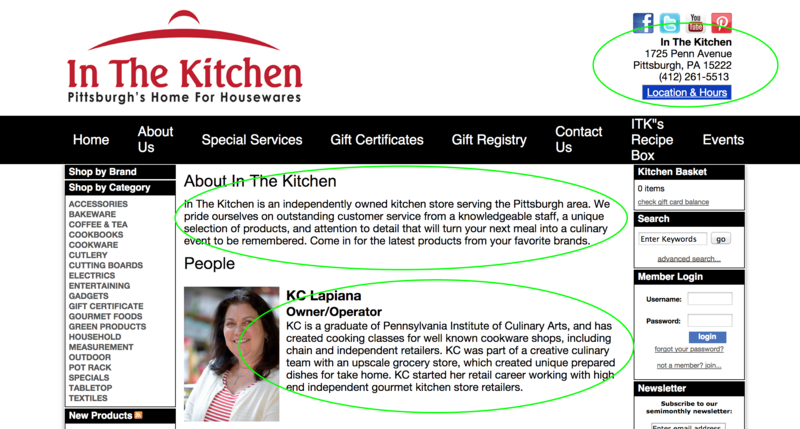 Page title: A good example from earlier is “In The Kitchen- Pittsburgh’s Specialty Kitchenware Store.” This title is keyword rich while also indicating where the store is located. Meta description: Your meta description is small paragraph of text under your site’s name that shows when you come up in search. Make sure you include your city and state here so potential customers will know that you are close to them. Content: As a rule of thumb, always include your address on each page. Also make sure that you are working your location into the copy of your About Us and Contact pages. Image Alt Tags: Utilizing image alt tags helps your content to show up in search. This is especially beneficial if you have a very visual website. Be sure to include a description of the contents of the picture as well as your location. 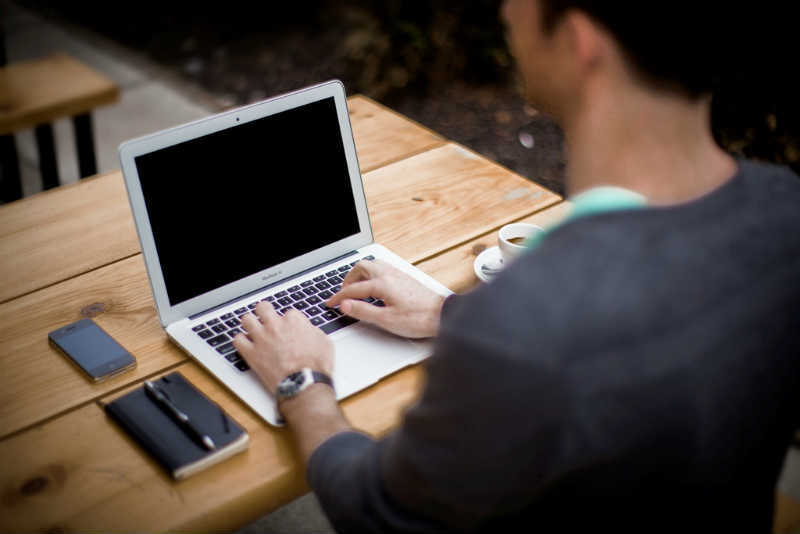 Online reviews are one of the most important aspects of local SEO. It signals to search engines, as well as potential customers, that you are relevant and reputable. There are hundreds of review sites on the internet, but if you’re just getting started with local SEO you want to direct customers to your Google+ page. A great way to drive these reviews is to make a handout card that thanks customers for their business and lets them know that you would appreciate a review of their experience. I suggest setting up a page on your website (mysite.com/reviews) that directs your customers to review site where you want them to leave their review. You’ll want to direct your customers to your Google+ page until you reach around ten reviews. Once you hit that mark you can send them to any other site you’d like to (Yelp, Angie’s List, etc), or keep sending them to Google. Here’s a quick tip make it even easier for customers to leave you a review on Google. Copy the URL of your Google+ page, and add ?hl=en&review=1 to the end. This will automatically bring up the review module when a visitor hits your Google+ page, making it much easier for your customers to share their experiences. A word of caution: be careful with how you solicit reviews. Review sites and search engines have complex algorithms in place that detect patterns in reviews that determine if they are fake or forced. You shouldn’t incentivise customers to leave reviews, ask for reviews only over a specific period of time or have a “review” station set up in your store. All of these will cause your reviews to be flagged. Offline events can give you an online boost. Holding events at your store can cause major buzz around your business, which could result a big local SEO boost. The first rule of event marketing is hosting an event that people want to go to, and bonus points if it benefits your community in some way. Example of good events are: charity fundraisers, food/toy drives, Make a Wish events, 5Ks, sidewalk sales, educational events, seasonal parties, etc. Whenever possible, hold the event at your store’s location as that address will more visible in local searches. Once you’ve nailed down what type of event you want to hold, promote it like crazy. Utilize email and social media marketing to get the word out, but also do a little bit of PR work. By posting your event on websites like Eventbrite, Eventful, Zvents, Craigslist Events, main street organizations, chambers of commerce, etc., you will gain valuable traffic and links from these sites which will help your SEO. Just make sure that the details for your event remains consistent on each of these sites. You may even want to pitch local news organizations to cover your event. Links from highly trafficked news sites can be especially helpful in providing your website with an SEO boost. Forbes has an excellent article on the do’s and don’ts of pitching the media that I highly suggest you check out. Finally, set up a dedicated page on your website for your event. This will help people find more information and will give external parties, like news outlets, a place to send traffic. Make sure to include the following on your page: event name, date & time, location (ideally your store), a short description of your event and your contact information. SEO can seem overwhelming and confusing at times. Follow these four easy steps and you should see local SEO results in no time.